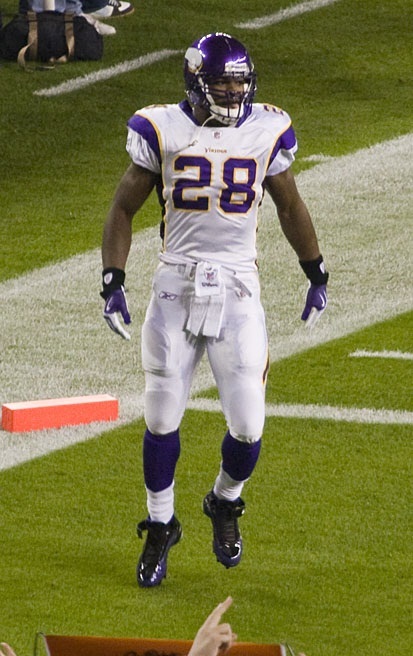 In fantasy football Adrian Peterson is a great player to build a team around. However if you had to build a real team from scratch with realistic fiscal constraints it's not as easy a decision. Photo by xoque. 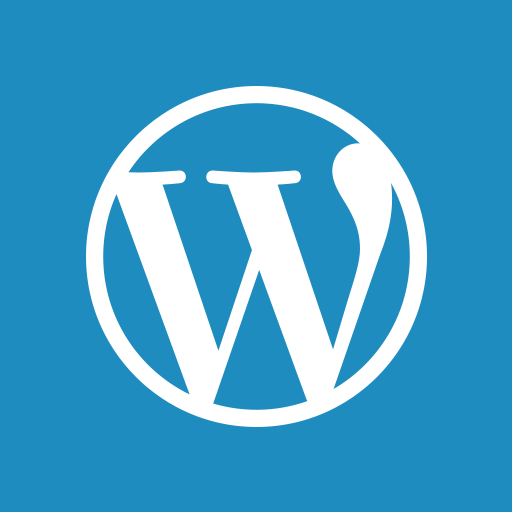 Last week, I announced the RSP Football Writers Project, which is the collection of terrific football writers who will each be given 4-6 weeks to construct an NFL team from scratch within the constraints of a salary cap. Fellow Footballguys.com writer Sigmund Bloom and I will be developing the salary list, personnel requirements, and fundamental questions that the writers must answer. We’ll also share the info and instructions here so anyone can download and construct a team. If I can arrange the right kind of panel to judge, I might even sponsor a contest for those of you playing at home. Stay tuned. For the past two weeks, I’ve had several initial thoughts about the construction of my team. I’m sure many of my ideas will change dramatically as I get further into the process of building my NFL team, but I thought I’d share my thoughts. In fact, I’ll probably keep you guys posted with my progress and depending on the situation, ask for your feedback. One idea I am going to implement is a Readers Team. Based on your votes, I’ll compile a team on your behalf. Today we’re going to begin voting on the Readers Team’s football philosophy. If we look back at these teams in 2-3 years and discover one of them is a powerhouse in every facet of the game then that writer is going to earn his stripes. Although we haven’t completely formulated the salary hierarchy of the players, we’re going to force the writers to make difficult choices. Having a strong philosophy will be paramount to building a competitive team. I’m an offensive guy at heart. The skill positions are the players I study the most. However, I find that the first question I have is the type of defense I want to build. As an avid IDP fantasy player who has made it to the final round of the Footballguys IDP Survivor leagues twice in the past three years as well as posting the best win-loss and points scored seasons in the history of the staff IDP league, I tend to make it a priority to build a strong defense and rely on my knowledge of offensive players to build an underrated offense that can compete well enough to put me over the top. Fantasy football is certainly different than real football, but you have to wonder if NFL coaches that are known as offensive or defensive gurus find themselves in similar situations. Bill Belichick was a great defensive coach, but the Patriots had the balance of star power and firepower on offense. Brian Billick and Jon Gruden were regarded as offensive gurus, but they were brought to the Ravens and Bucs teams with great defenses in place. I used to enjoy the irony that offensive and defensive gurus were brought to NFL teams as head coaches and the side of the ball that was their specialty often struggled mightily. However, that’s often shallow analysis. All Billick and Gruden had to do was make the offense “productive enough” for these teams to win an NFL Championship. Jeff Fisher built a strong defense until his offense caught up. Then he rode the offense while using his expertise to keep the defense competitive. Photo by Rex Hammock. I can think of other examples of great coaching efforts. 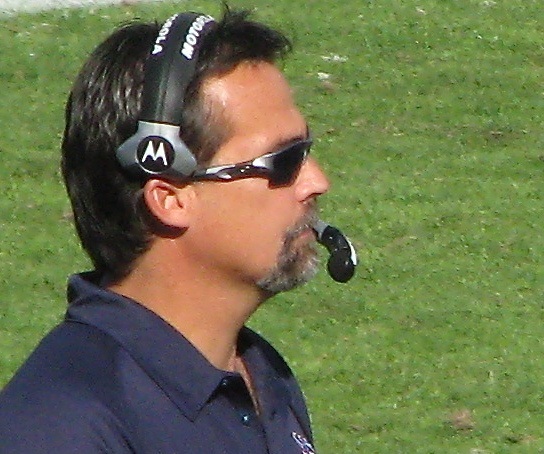 Jeff Fisher was a defensive coach and early in his tenure the Titans defense was arguably as good as the Ravens at the turn of the millennium. As the Tennessee offense improved, Fisher and his coaching staff were able to keep the defense good enough with lesser players to compete. Bud Carson’s Cleveland Browns of the late `80s was an insanely good coaching effort to reach the AFC Championship for the team’s third time in a decade. Carson, the architect of the Steel Curtain defenses of the `70s, took over a team with a strong ground game and a quarterback with the similar game of Philip Rivers, and worked miracles with the Browns defense. Tony Dungy with Peyton Manning and the Colts is another example of this dynamic. On the other hand, Sean Payton is a great example of an offensive mind that has constructed a point-scoring juggernaut and picked the right coaching staff to execute a defensive philosophy that complements the Saints. Gregg Williams is perhaps the most aggressive blitzer among NFL defensive coordinators. Titans quarterback Matt Hasselbeck says that Williams is apt to try anything during a game. When Williams has an offense good enough to score 21 points in a quarter, the fallout from getting too aggressive only happens with a select number of teams. Offenses: Spread, Balanced, or Run Heavy? Although building a defense has been the first question on my mind, my natural preference is to go strong on offense. I like the idea of a high-octane passing attack that uses multiple receivers and hybrid players at running back and tight end to spread the field or execute great plays from the draw and screen game. However, this means you have to break the bank on a quarterback. As we saw with the Colts, if you lose that quarterback to injury your team is lost. I also love a physical style of play too much to simply opt for that style of football without considering a balanced attack. Think about the Colts with Manning, Edgerrin James, Marvin Harrison, and Dallas Clark. Even post-injury, James was one of the best at moving the chains and his between the tackles skills, pass protection, and receiving skills combined with Manning’s accuracy made the play action game deadly. Norv Turner loves to achieve a perfect balance on offense but as his post-Cowboys exepriences have shown, its a difficult task to achieve. Photo by Janna McLaughlin. The Broncos offense with Terrell Davis, Rod Smith, Ed McCaffrey, Shannon Sharpe, and John Elway are another team that could throw the ball when needed, but could pound you into submission. 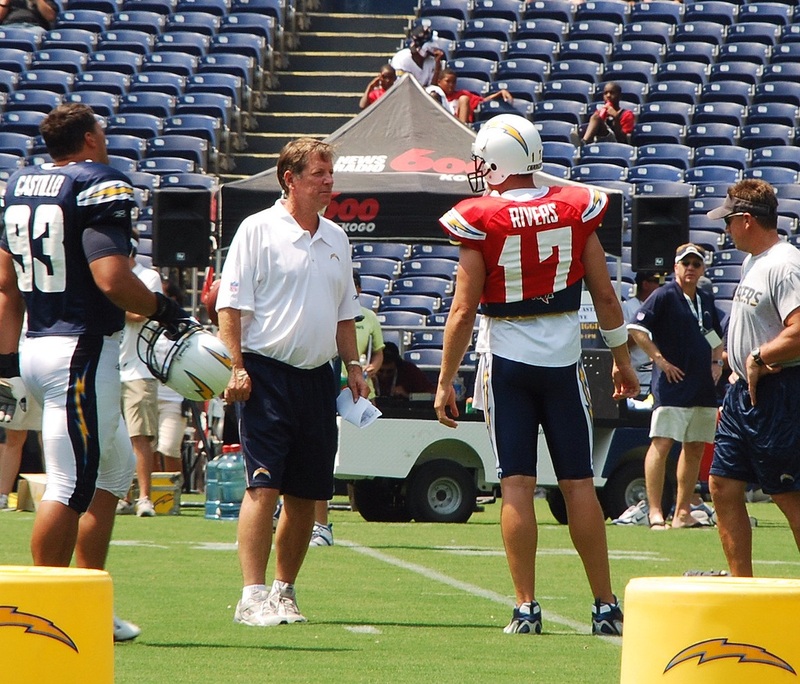 Norv Turner has helped construct two teams along those lines: the `90s Cowboys and to a lesser extent the Chargers. These offenses are the NFL ideal. The downside is actually building a balanced offense successfully. It’s the reason why everyone wants to achieve that balance, but so few have it. The Colts did a great job building an offensive juggernaut, but the defense always struggled. The Broncos had a decent defense, but they hit on late-round and free agent picks like Davis, Smith, McCaffrey, and Sharpe. The Cowboys built a dynasty because it successfully stockpiled great draft picks through the first-of-its-kind value chart and then picked the right players. If our salary hierarchy works as intended, the writer that constructs the best “balanced offense” that still looks great on paper will have stayed healthy and/or hit home runs on enough late-round picks to achieve that balance. I’m not sure if building a balanced offense in these conditions is wise. There’s a fine line between hubris and naivety and in the NFL those days might be gone. Look at the Texans and Chargers. On paper these offenses look great, but every year we see them struggle to play consistent football because there’s not enough depth to account for injury or the defensive side of the ball struggles enough to bring down the performance of the entire team. That leaves an option that becomes more intriguing with each passing week: the option. Yes, I’m talking the Broncos and Tim Tebow. In theory, acquiring a strong but swift option quarterback might be easier to find than a elite passer. I should also be able to find lower cost, but high-quality players at other key positions. The demand for certain skill sets from each position often differs enough in this offense than the norm. In theory, while other teams are paying a premium for move tight ends, multiple receivers and great pass blockers on the offensive line, I can pay less and field a great ground attack and spend more on defense. Despite the Patriots doing what most expected against the Broncos, the idea is growing on me. I think 2-3 years from now, the Broncos could have more depth at RB and on defense to handle Brady and this game doesn’t get out of control with one RB injury and a few special teams turnovers. Soon, I’ll be writing about (or someone equally or more qualified) basic philosophical choices for defense. Once we lay out the choices for both sides of the ball, you guys will vote and the Readers Team will have a basic philosophical approach. Matt- After you and the other writers create your teams, would it be possible to run the teams through some type of game simulator? It would be really fun to see which philosophy works best over a 16 game schedule. I’m not sure which simulator is best, but Strat-o-matic is fairly accurate to real life. It would also be fun to have your readers submit teams. You and the writers could pick the top 32 teams to mimic the NFL. The teams could be divided up in divisions and play a 16 game season. Playoffs could be held to crown a champ. The readers champ could then play the writers champ in the ultimate RSP Bowl. It’s a lot of work, but it would sure be fun. I’m very interested in the dfensive side of the ball. How many go 3-4 vs. 4-3? Does anyone have the guts to try a 46? Excited to see how it plays out. Can you guys post up the numbers and parameters you’ll be using, e.g. salary cap numbers for each player? I can see myself spending way too much time tinkering with teams, totally loving this idea. I will be providing everything to readers that the writers will have so you can build your own team.